If you are planning to spend a few days in Lille, then you can easily rent a car from our Sixt Marcq-en-Baroeul car rental station. We offer an efficient car hire service from primary city locations, such as the train station, which gives you the convenience to tour the city and surrounding French countryside at your leisure. You can book a range of car models for your journey, including sports cars, convertibles and 4x4s to ensure that you get the best driving experience during your stay. Car hire in Lille is an excellent way to see the local sights and you will have the freedom to explore the city at your own pace. This French city has grown from an economic metropolis into an attractive tourist destination that is famed for its museums, shops and night life. 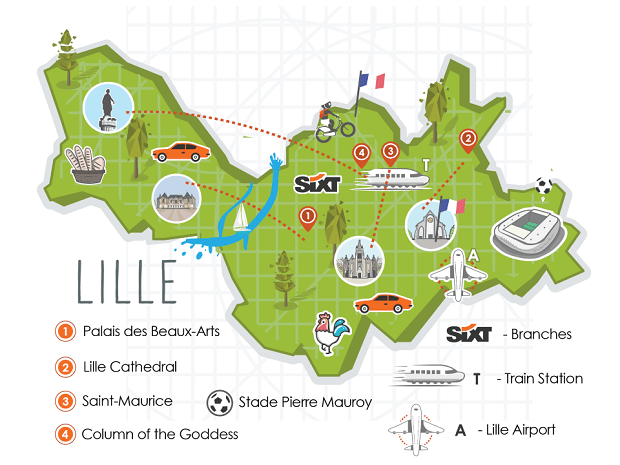 A car hire from Lille Marcq-en-Baroeul not only allows you to enjoy visiting the city's most popular attractions, such as the world famous Palais des Beaux Arts and the house of Charles de Gaulle, but also gives you the opportunity to drive out to see the incredible Citadel of Lille or relax at the Zoological Park. At the end of a busy day you can drop off your car hire in Lille and unwind in one of the city's elegant restaurants to try some of the local seafood. We want you to make the most of your visit and look forward to seeing you in this lovely city. Due to the limited parking in the surrounding of our branch (only 2 hours!) we recommend to arrive by public transportation. There are no parking options on our parking for your private vehicle. Many thanks for your understanding! Take the Minitunnels (D670/D5A/D5B/D660) towards Roubaix. At the traffic lights near the Courtepaille, take the side road on the right and turn left at the second set of lights to reach the other side road. You will find the Sixt branch on your right in about 600 m.
Take the A1 then the A22 towards Tourcoing/Gant. Come off at Junction 9 (Le Sart). When on Rue Jean Jaurès, turn left onto the Avenue de Flandre side road at the third set of lights. You will find the Sixt branch on your right in about 2 km. Get off at the "Accacias" stop on the tramline towards Roubaix. The key box is located in front of the Sixt branch, next to the letter box at the right of the entrance.